The LXIcon Newsletters - what we would call Progress Reports today - were printed on a single foolscap sheet. The first was single-sided, the other two double sided. They were undated. As most of the Con Committee live in or around Cheltenham and as this part of the country hasn't suffered a SF Con, plus the fact that we are served by both mainline train AND coach services, investigation went ahead locally. Finally we found the Hotel which matches the George in alomst every way. It is just a little larger than the George (52 beds), it has a night porter, it does not object to noisy room parties and it has a ((unreadable)) Hall which will be equipped with a bar! There are also hotels in the vicinity which can act as overflow hotels, but we know that YOU will want to stay in the main one, won't you? Where is it ? Oh, yes ... THE NEW COUNTY HOTEL, SOUTHGATE STREET, GLOS and, just like the George, its charges are 25/- Bed & Breakfast. Already, the Con Committee, plus the BSFA Committee, will fill a fifth of the Hotel, so get your application form in early for the New County - send it in NOW - and if you want more forms then write to Keith Freeman. 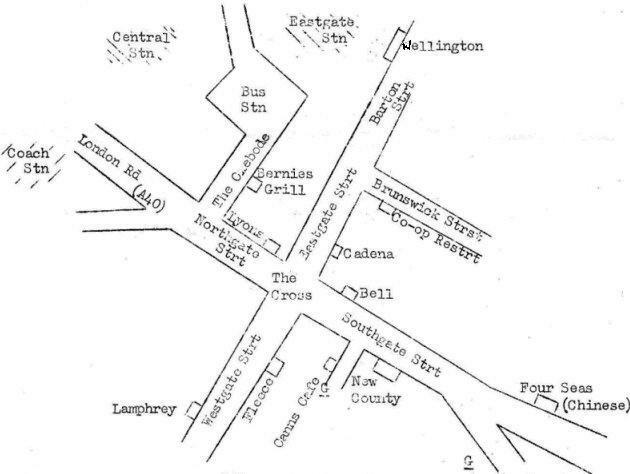 The overflow Hotels are the BELL HOTEL (charges 27/6 B&B) the WELLINGTON (charges 22/- B&B) and THE LAMPHREY (charges 18/6 B&B); all close to the New County. The next newsletter will contain information on the Con Programme (any suggestions you have will be welcomed by either Tony Walsh or Bob Parkinson. ), a map of Gloucester (showing exact location of Inns, Pubs, Cafes and Ladies), and other information YOU NEED, this newsletter, however, will only be sent to enrolled members....... of course, anyone who joins later will get all back issues of newsletters etc. In our opinion this list is still far too short, so don't forget - when writiing to other fen - MENTION THE CONVENTION : And also point out that the New County Hotel is nearly full......	To help you encourage others to join we enclose a couple of application forms for you to pass on to your fen friends. The programme is still fluid, but is solidifying rapidly, several items, such as the Don Ford Slide Show, the Pro Film and the Fancy Dress Ball have already been allocated places within the three day programme. Three day Programme ? you say. Yes ! This Con means to give you your money's worth. It will therefore commence on Friday evening, and finish (officially) late Sunday night. You'll notice that we mention a Fancy Dress Ball - and this year we DO mean a FANCY DRESS BALL !! Between now and the Con at Easter you have time to make up that fancy dress, or special costume, especially bearing in mind the wide scope given by the theme: THE TRANS-GALACTIC TOURIST. Terrans (circa 20th Century) (D3DG) - Too common at recent Cons. Providing you're not costumed as any of the above we'll be glad to meet you. Being serious, for a moment, everyone will enjoy themselves so much more if there's a good fancy-dress turn-out. We know that Liverpool, London and Cheltenham groups, as well as other fen, CAN do it. As you can see from the map, the Fleece is much nearer to the New County than the |Wellington, consequently the prices are the same, people indicating the Wellington as second hotel choice will, of necessary, be booked in at the Fleece. There are garages at the New County, please write to Ethel Lindsay if you want one booked. Although they are not marked on the map, facilities for parking cars in Gloucester appear to be quite plentiful. More auction items are needed - books you have no further use for might enable the Con to make a profit - which will help YOU next year. Bob Parkinson will be pleased to receive anything (please mark any parcels "AUCTION" on the outside). If you are not yet a member of the Convention there are two things, at least, you ought to know;	the Con hotel is FULL, there are, however, several other hotels near to the New County (see the Con Application Form for further details), secondly, when you join, Newsletters Nos. 1 & 2 will be sent to you. When you book it would be best if you state, if possible, your likely time of arrival, as Barnes Garage will be closing at 6.30 p.m.
- as you all know, or should, Kingsley Amis is the author of "New Maps of Hell" - one of the most recent, and thorough, as well as fair, criticisms of science fiction. Kingsley is not a science fiction novelist, having had published several main-stream novels, including "Lucky Jim", "I Like It Here", "A Girl Like You" and "That Uncertain Feeling". 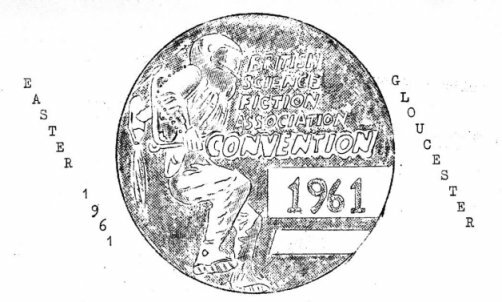 However his play, "Touch and Go" (pure science fiction), was presented on the third programme of the B.B.C. in 1957. Kingsley is also connected with science fiction in two other ways, he is one of the selectors for the Science Fiction Book Club and the Sunday Observor science fiction literary critic. Apart from science fiction Kingsley has another interest which many fans share, namely - jazz. We welcome him, but warn him that not all fans share his opinions about science fiction - if YOU disagree with him here's your opportunity ........ (Please, Kingsley Amis, take this in the right spirit (Vodka)). Can other items on the programme live up to this standard ? - we say YES, for included will be such not-to-be-missed items as "The Don Ford Slide Show" (unfortunately without the personal presence of Don Ford !) , "This is Your (Fan) Life" -and a LiG production, to mention just a few. The programme is actually finalised now, but to learn everything you will have to await the programme booklet, now in the course of production, however something else that can be mentioned is the Fancy Dress Ball - which will really be something this year - don't feel out of things, get cracking on that costume you've always been thinking about, the theme, if you want reminding once again, is "The Trans-Galactic Tourist". Only one thing is wrong with the programme at the present time, that is the expense involved in putting it on! We deliberately put the Convention Fees at as low level as possible, and we are relying on the auction to help us balance the accounts and show a handsome profit. Here is where, once again, we call upon YOU; go through your bookshelves, cupboards and other places where your collection has overflowed - arything you have repeated, or have read and finished with, why not send it for auctioning - the address to send it to is "Bob Parkinson, 52, Mead Road, Leckhampton, Cheltenham" - and could we bother you further to mark it on the outside of the parcel "AUCTION", specifying if you prefer it to go to the TAFF, BSFA Con or BSFA Library funds. The subject of refunding Convention fees has been raised once or twice, the reason why we have stipulated, this year, that money will accompany Convention Application Forms is to enable the Con Committee to know what they have to spend, and to save a lot of time and bother at the Convention. Due to this policy we CANNOT make refunds, except under very exceptional circumstances. You night disagree with this, but some hard-and-fast rules have to be laid down, and this is one of them. All that now remains is to give credit, firstly the heading on page 1, this was done by Bob Parkinson, I myself did the heading at the top of this page - I'm wondering what it'll come out like! Mayhap I'll have to hide my head in shame! The contents herein were thrashed out by the Con Committee - and Magaret Jones should be thanked for being hostess to the Committee.